Shani Elitzur won a double honor in the student competition Challenge 2014 for solutions to reduce the use of petroleum in transportation. 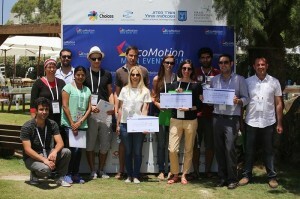 Shani Elitzur, a Ph.D. student supervised by Prof. Alon Gany and Dr. Valery Rosenband, won the double honor of 2nd Prize and the Audience Favorite in the student competition Challenge 2014 for solutions to reduce the use of petroleum in transportation held during EcoMotion Conference in Sdot-Yam on May 22-23, 2014. Shani’s presentation as well as a model car operated by her as technology demonstrator, drew much attention from the conference participants. These included representatives of academia, industry, international automobile companies, start-up companies, Government, as well as guests from abroad.